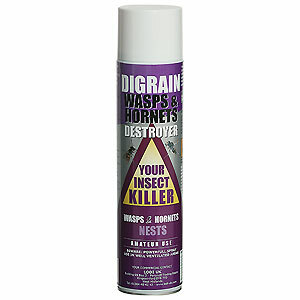 Digrain Wasp & Hornet Nest Destroyer is a highly effective wasp nest killer aerosol foam suitable for treating wasps nests from a safe distance. Digrain Wasp & Hornet Nest Destroyer is an excellent wasp nest killer and is ideal for the treatment of visible wasps nests in lofts, outbuildings, trees and under eaves. The powerful jet action of this aerosol means that it can be used to treat wasps nests from a distance of 3m, increasing user safety. kills wasps as they return to the nest, killing the entire nest within 24 hours of treatment. Each 600ml can contains sufficient foam to treat up to 4 wasps nests. Direct spray first towards the entrance to the nest and then apply enough foam to cover the entire nest. Treatment is best carried out either in the early morning or evening as this is when wasps tend to be less active. We highly recommend that you wear protective clothing during treatment. NB Digrain Wasp & Hornet Nest Destroyer is only suitable for use if the nest is visible. If the wasps nest is not visible, then please treat the entry point with Pest Expert Wasp Nest Killer Powder (see related products below).